Initially, NVIDIA demonstrated a sample operating at 2.1GHz which of course gave enthusiasts and in particular extreme overclockers, high hopes for unprecedented clock speeds in the region of 2.8GHz and beyond. As we all know, that did not materialize and between the limited scaling with more voltage and the somewhat lack of comprehensive overclocking tools and BIOS modification software. There’s simply no case to be made for the GTX 1080 to extreme overclockers. 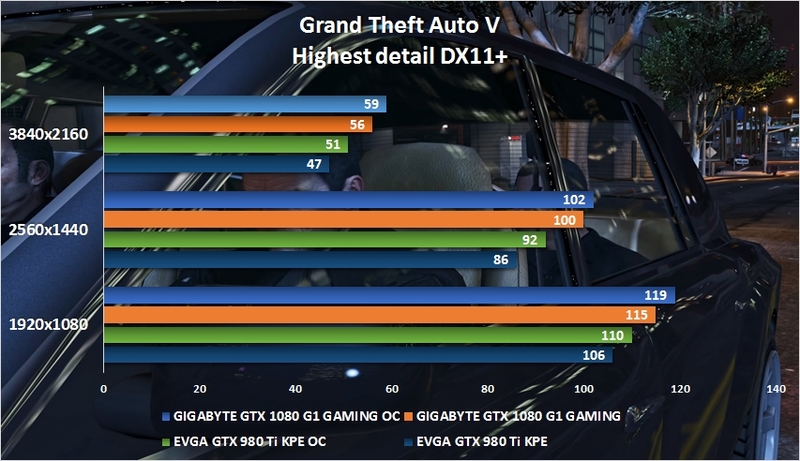 Unless there’s a drastic change in the near future or some discovery on how to truly unlock the GTX 1080, it looks as if the GTX 980 TI remains the king of the hill. After all, it was just a couple of weeks ago that a new 3DMark Fire Strike Extreme record was recorded with GTX 980 TI GPUs. So hold on to those GPUs if competitive overclocking is your game. You just may have to wait for the TI successor which may only arrive in 2017. 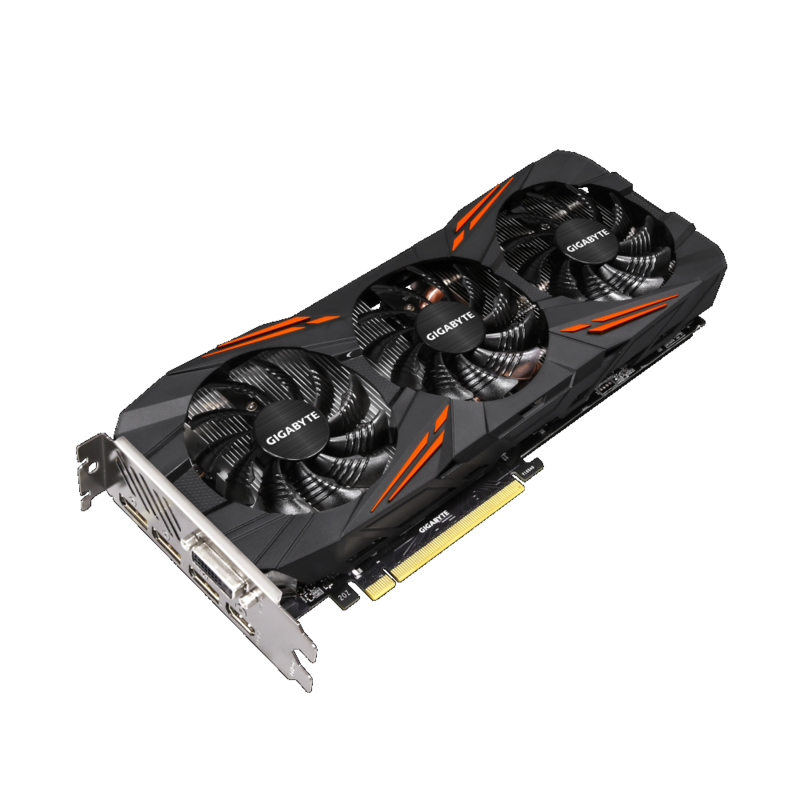 It isn’t all doom and gloom however – in fact; the GTX 1080 offers exceptional value and unparalleled performance for gamers, easily besting all 980 TI cards, at least that is true for the G1 GAMING. It is meant to be a GTX 980 replacement, but it offers close to twice the performance in some instances courtesy of some tuning on NVIDIA’s part and a terribly efficient 16nm TSMC node. From a 180W TDP GPU (Founder’s Edition) we are recording performance that is not accessible by GPUs consuming twice as much power. This speaks volumes to the progress made in both manufacturing process and design decisions undertaken by NVIDIA. That aside, one is not here to tell you about the technical merits of the PASCAL GPUs. This is about the GIGABYTE GTX 1080 G1 GAMING. A mouthful indeed but it is a graphics card worth your consideration especially given its comparatively low retail price, but high performance. 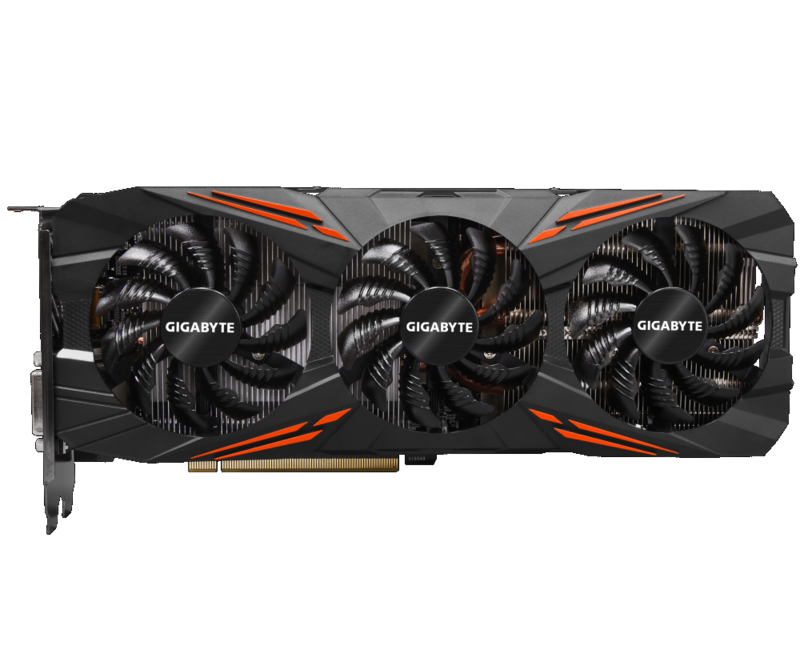 What seems to have occurred is that GIGABYTE has in some way moved away from the Windforce naming scheme and instead, re-dubbed those products as the G1 GAMING parts. Replacing the previous G1 Gaming graphics parts would be the Xtreme Gaming alternatives which are supposedly of the highest workmanship from GIGABYTE. 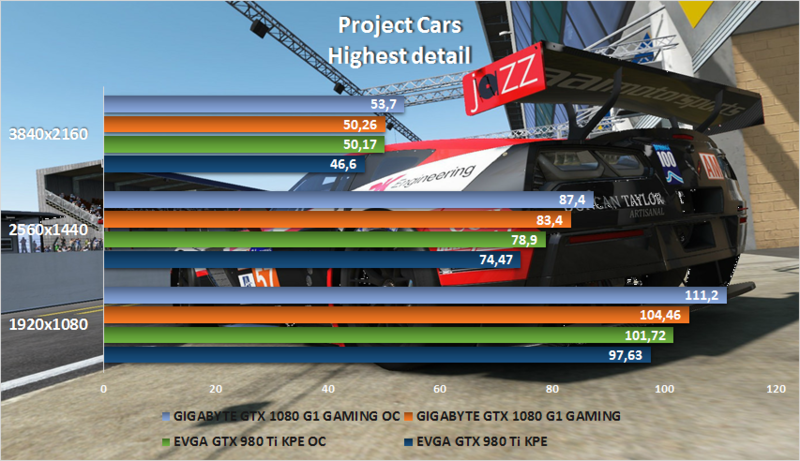 I will examine a number of these in future, but for now it is the G1 GAMING that has my attention and I must admit that it is one impressive graphics card. At its core is a straight forward design, slightly improving on what NVIDIA offers, but dialling in the GPU clocks to offer near peak performance out the box. There’s really not much for you as the end user to do but install the card and the Xtreme Gaming software should you so choose. Even without this utility, you will still experience the best performance money can buy. 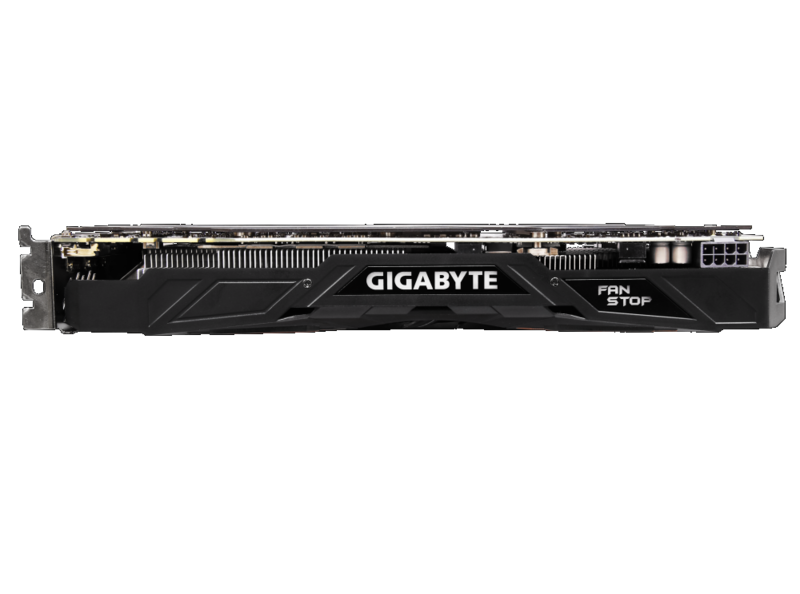 Whatever other GTX 1080 cards may offer, there isn’t a single one that can claim to offer tangible performance gains over what GIGABYTE has delivered here. With a measured clock speed as high as 1964MHz, that’s pretty much at the limit of what the GP104 silicon can deliver at present with the limitations NVIDA has built into both driver, BIOS and perhaps silicon as well. 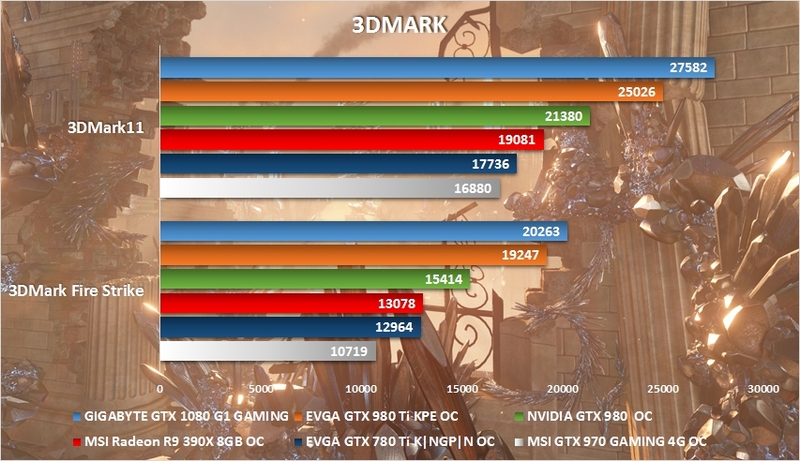 In my overclocking I was able to reach clocks as high as 2113MHz for 3DMark Fire Strike Ultra runs, but those are not game stable frequencies and as such, the results recorded are ones with the GPU at only 2030 to 2067MHz, a far more realistic target for normal and artefact free game operation. A GPU block from the likes of BitsPower or EKWB would likely allow one to extend that clock speed to the 2.1GHz mark, but as it is, the manual overclocking is not worth it given just how high the shipping clocks are to begin with. In fact, I found that the performance differences between the out the box clocks and the OC mode were largely down to the memory clock differences. The G1 GAMING like all other G1 cards makes use of the MICRON GDDR5X chips which are rated at 10GHz. This particular sample was able to operate happily at 11.2GHz (1400MHz SDR). That boost in bandwidth seems to have let the GPU stretch it’s legs a bit and deliver a few frames more in both minimum and average frame rates. The graphics card which the G1 GAMING was matched up against was the EVGA GTX 980 TI K|NGP|N Edition which is undoubtedly the fastest GTX 980 TI on the market. First up is 2014’s Metro Last Light REDUX using the 4A Engine. It’s getting a bit long I the tooth, but does feature some modern rendering techniques and can bring even the most demanding graphics card to their knees, especially at 4K resolutions. 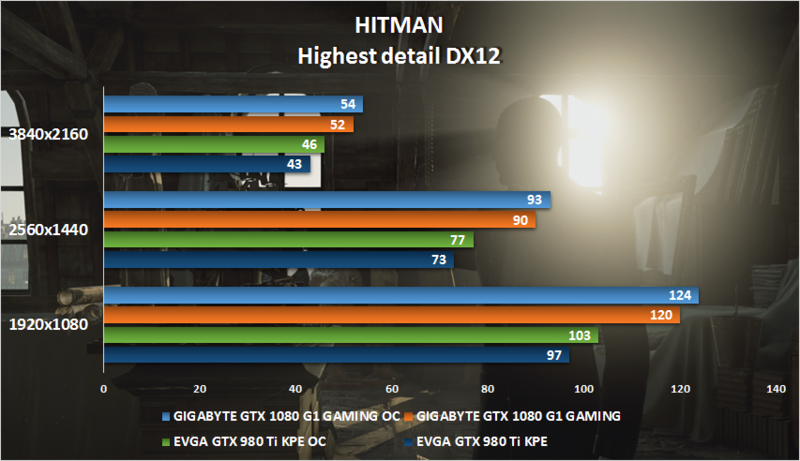 The GTX 980 TI holds its own here, especially at the high resolutions, but the G1 still comes out ahead ultimately. Next is BATMAN ARKHAM KNIGHT, this Unreal Engine 3 based game could have been the pinnacle of the franchise, but marred with so many issues on the PC. It became the epitome of what was wrong with so many sub-standard PC ports. Either way, it is a beautiful looking game that makes use of the latest rendering techniques. 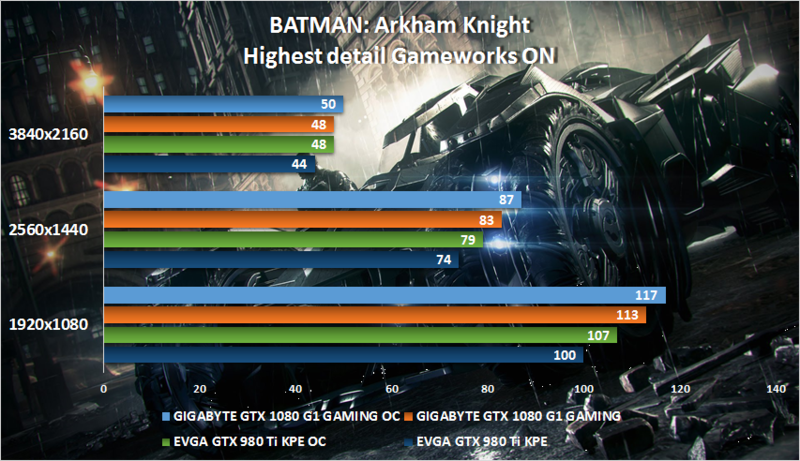 These results were recorded with full NVIDIA GameWorks features enabled. Again the G1 Gaming does well here, matching the overclocked GTX 980 TI out the box and beating it when overclocked at 4K. At every other resolution, it’s just outright superior. Dragon Age Inquisition, was the last of the trilogy and by far the prettiest of the lot. Using the Frostbite 3 engine, it represents what many modern day games are capable of and is sometimes more demanding than many titles from 2016. There still isn’t a single GPU solution that is capable of cracking the 40fps barrier here at 4K but the overclocked G1 GAMING is proving a lot more playable than what the overclocked GTX 980 TI can provide. Again, at the other resolutions, the G1 GAMING runs away with it. Using the highly scalable RAGE engine, GTA V is sometimes just incredible to look at, able to render vast distances and vistas with alarming detail and vistas. This game was highly taxing on GPUs prior to the 980 TI and of course the GeForce 10 series. It seems to have been tamed now, with frame rates well above 45fps for both the GTX 980 TI and the G1 GAMING. The GIGABYTE card offers exceptional performance even at 4K, making it an amazingly smooth experience. The latest entry to this old franchise, is essentially a re-boot, hence, the “HITMAN” title. Built on the GLACIER ENGINE 2 it has support for DirectX12 and host of relevant ad related features. The game looks good, but does not represent anything that would otherwise not be possible with DirectX11 class hardware and performance between the two APIs is roughly the same. Either way, performance from the GTX 1080, is far ahead of what the mightiest GTX 980 TI of them all can deliver. Perhaps a nod to the fact that the GTX 1080 was built for the latest titles and beyond. 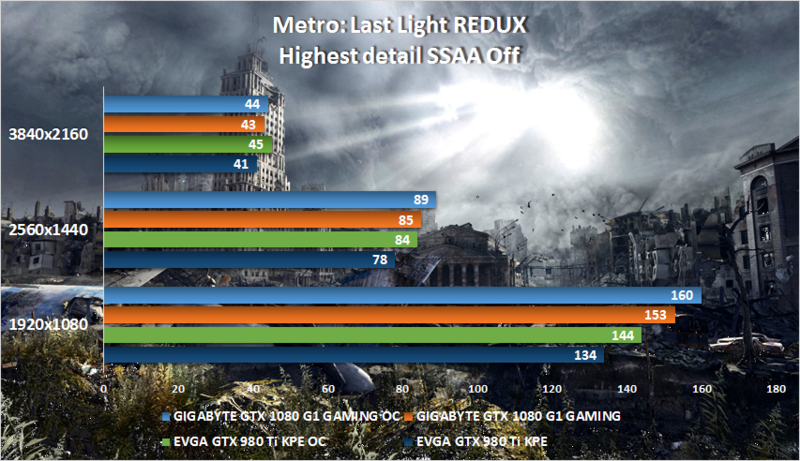 The GTX 980 TI, even though superior on paper, just cannot keep up. Built on the MADNESS Engine, Slightly Mad studio’s Project CARS was the poised to be the definitive racing simulator on the PC until ASSETTO CORSA (A title that we will switch to in future for testing). This game can look absolutely stunning in pictures, but not so much in motion. It isn’t poor by any stretch of the imagination, but a little bland visually especially compared to its modern day competitors such as FORZA motorsport APEX on the PC and of course ASSETTO CORSA. 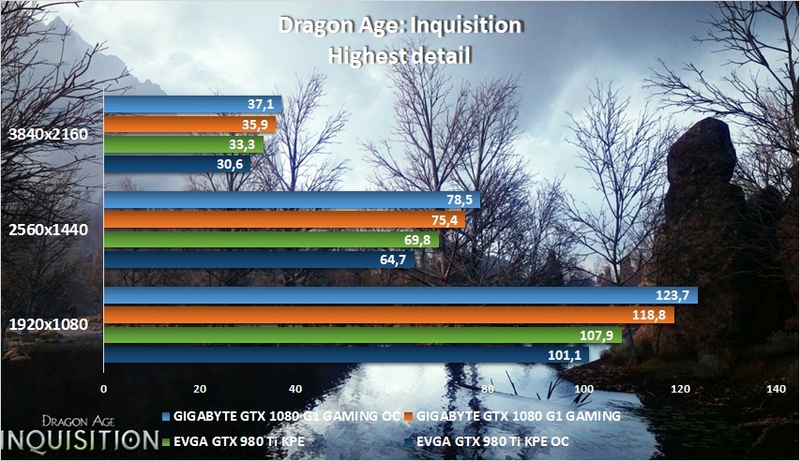 The 980 TI here puts in respectable numbers, but once again the G1 GAMING is just faster. 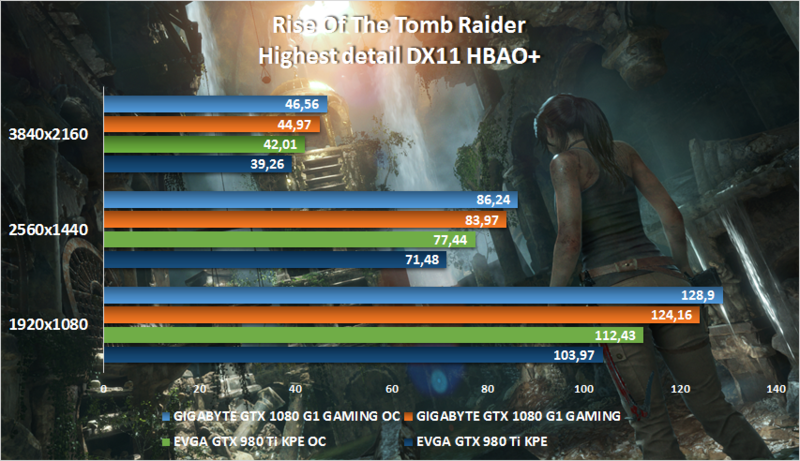 Rise Of The Tomb Raider is the final game, which like HITMAN supports DirectX12. Unfortunately for whatever reason, the DX12 performance is no faster than what is available when using DirectX11 and in some instances causes performance issues. Built on the Foundation Engine it features breath-taking visuals sometimes and is a great example of what is possible with game technology today. At 1080P the difference between the two cards is rather substantial but diminishes at the resolution is increased. Once again though the G1 GAMING is just superior. Last is Synthetic tests. 3DMark and 3DMark 11. As soon as Timespy is released, we will be letting go of 3DMark11. It’s served us well, but it is old and it’s results are not as meaningful as they used to be. It can’t be clearer than this, the GIGABYTE GTX 1080 G1 GAMING is hands down faster than the fastest GTX 980 TI money can buy. So hopefully that puts the matter to rest for those who may have still been wondering. The electronic differences between the G1 GAMING and the Founders Edition card are not that many. Mainly it’s the use of an 8+2 Phase VRM, while still employing the same uP 9511P controller. Cooking is via a familiar Windforce 3X cooler that houses three heat pipes and three fans. The Heatpipes make contact with the GPU core directly which does help dissipate heat that much faster. As always, the cooling performance is impeccable and even though there are better, more exotic solutions out there. 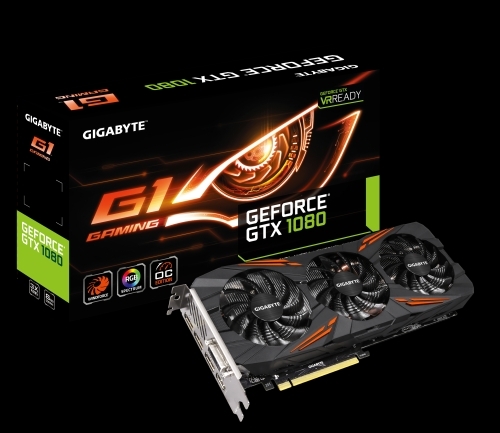 For the GP104 there’s not much more needed than what GIGABYTE has provided. The card remains cool even within a case. Should you wish to maintain those high boost clocks, simply set a minimum fan speed of 50% and you’re good to go. It’s hardly audible above the case fan noise and it keeps the GPU operating at reliable frequencies. The last thing that one should make mention of is the back plate, which is more for aesthetic purposes than anything else. It does aid in structural rigidity and cools some smaller components, but you’d be hard pressed to notice a difference in temperatures, with or without it. Having said that, it remains one of those things that you’d rather have than not. As gaming cards go then, it doesn’t get much better than this. It’s a straightforward solution that maximises what you can get from the GP104 Core at a more than reasonable price.